Types of lavender-colored flowers come in a vast array of options. Depending on the particular needs of your garden, identifying different types of lavender-colored flowers gives you the versatility to add the light blue-purple color you desire in a variety of bloom times and sizes. Additionally, some lavender-colored flowers are prized for their fragrance, a characteristic that adds an extra dimension to your gardening space. Lavender flowers (Lavandula angustifolia), also referred to as English lavender, are, as their name implies, lavender-colored perennial flowers. Lavender plants display aromatic flowers during the summer season with gray foliage. Thriving in full sun and dry, infertile soil, lavender grows to a height of one to three feet, according to the University of Florida IFAS Extension. Additionally, the oil extracted from lavender is widely used in perfumes, cosmetics and aromatherapy. Grow lavender flowers in USDA Hardiness Zones 5b through 8. Mexican heathers (Cuphea hyssopifolia) are perennials that display small, lavender-colored flowers and green foliage, according to the AgriLife Extension. Thriving in full sun to light shade, Mexican heather plants bloom in spring or summer, prefer moist, well-drained soil and grow to a height of six to 24 inches, according to the North Carolina State University Extension. Grow Mexican heather flowers in USDA Hardiness Zones 8b to 11a. Jacaranda trees (Jacaranda mimosifolia) display clusters of faintly aromatic, lavender-colored flowers with fine green foliage. With a bloom time of spring to summer, jacaranda trees thrive in full sun, prefer well-drained soil and grow to a height of 25 to 40 feet, according to the University of Florida IFAS Extension. Grow jacaranda flowers in USDA Hardiness Zone 9b. Fall aster flowers (Aster sp), also known as michalmas daisies, are lavender-colored perennial flowers with yellow centers that bloom during the fall season with green foliage, according to the AgriLife Extension. Thriving in full sun to partial shade, fall asters prefer well-drained soil and grow to a height of one to four feet, as explained by the North Carolina State University Cooperative Extension. 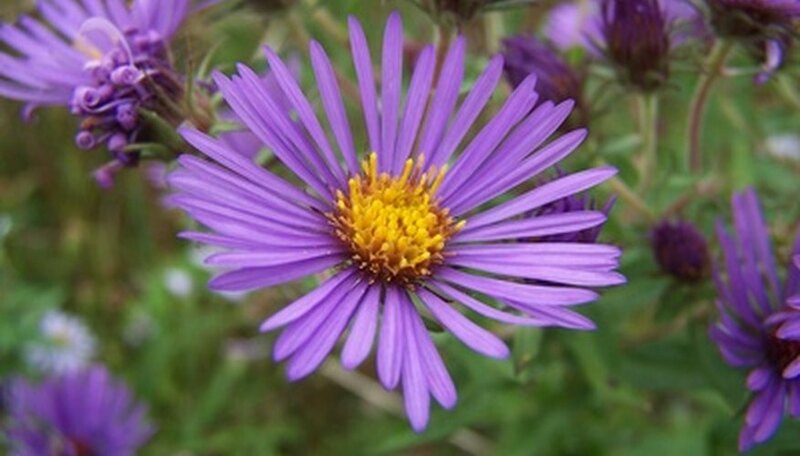 Grow fall aster flowers in USDA Hardiness Zones 5 to 8.